Try to guess how many flights President Bush has flown on Air Force One since taking office. It's 1,675 - more than 200 flights in each of the last eight years. 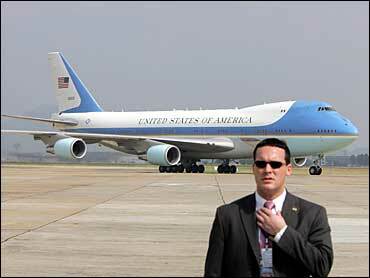 And on nearly all of those flights, Col. Mark Tillman, 51, was at the controls of Air Force One. But now, he's got just one mission left for George W. Bush - to fly him home to Texas on Tuesday as the former president. The aircraft will be the familiar 747-400 that routinely serves as Air Force One, but that won't be its radio call-sign on Tuesday afternoon, since Mr. Bush will be out of office. The flight home is a military courtesy to the former commander-in-chief. "It'll end the president's term in office and it'll also end my tenure at Air Force One," said Tillman in a radio interview with CBS News. After flying Mr. Bush to every state in the country but Vermont, and on 49 foreign trips to 75 countries, many of them more than once, Tillman will be ending his 30-year career in the Air Force. Bush nominated him for promotion to brigadier general, but the Senate Armed Services Committee never took action on it. So the modest and soft-spoken Tillman will be leaving the military for a pilot's job in the private sector. He concedes that "nothing will compete" with the experience of piloting Air Force One. "I'll have tremendous memories of growing up as a lieutenant and working my way to be President Bush's pilot," he said. Those memories include his most stressful day as the President's pilot - Sept. 11, 2001. "9/11 was a challenge for us because we didn't know what was going on," said Tillman. His prime objective that day, as it is every day, was to keep the president safe - even as America was under attack - and there were reports that Air Force One was another of the terrorists' targets. Mr. Bush had been visiting an elementary school in Florida when the attacks on America began and he wanted to get back to Washington fast. "Shortly after we left Sarasota, we got word that there was confusion amongst ourselves as well as the air traffic controllers," recalls Tillman. "There was an aircraft that they felt was coming towards us." "In reality, just his transponder was off [and] he hadn't checked in with the controller right afterwards," Tillman said. "But we kind of made our own scenarios that day where anything that could go wrong would go wrong." "As we were heading over Gainesville with a plane coming at us - assumed to be a hijacked airliner - that's when we turned and headed out to the Gulf of Mexico to try to regroup and figure out where we could bring the president to keep him safe." In search of a secure location for the President, Tillman ferried him to Barksdale Air Force Base in Louisiana and then to Offutt Air Force Base in Nebraska before getting clearance to return Mr. Bush to the nation's capital. Looking back, Tillman said Air Force One was not really a target that day, but "we always treat it as though the president could be a target." Tillman was also the pilot who surreptitiously flew Mr. Bush to Iraq on four occasions - including Mr. Bush's first visit on Thanksgiving 2003. "Originally, there was just a handful of us that knew about it. Myself and my navigator planned the entire mission and then we slowly at the end - the day prior - let everybody know on our crew exactly where we were going to go. Even the flight attendants until the day of - didn't know where they were going." Tillman serves as Commander of PAG - the Presidential Airlift Group, part of the 89th Airlift Wing at Andrews Air Force Base. Tillman trumpets his group's "zero-fail mission." "Every time the President's ready to go, we're ready to go. That's a result of the best of the best in the United States Air Force and the best of the best maintainers." Tillman has high regard for Mr. Bush, saying "he's definitely a great man" for whom it's been "truly an honor to fly." And he views the 235 personnel assigned to PAG as "kind of the 'Men in Black' behind the scenes" scrambling to prevent any mishap from distracting from the president's message on any given trip. "Everything on the plane has to be perfect. We have to make sure we present the right image of the United States Air Force while we're working for the White House." But that will soon be over for Col. Tillman. He'll soon be flying a corporate chief executive officer - instead of the chief executive.